Judge a book by its cover? Asus wants to poach in the starter sector of multimedia notebooks with glossy piano lacquer, a snazzy design and a switchable graphic solution. Or don't they? Is the 15.6 inch notebook UX50V more an office device that looks good but is barely suitable for multimedia due to the weak hardware? We released the designer laptop on our test course and made our verdict without being blinded by its looks. Although attractive, we weren’t hugely impressed with the keyboard, while the design of the trackpad buttons is woeful. And despite its ability to switch to a discrete graphics chip, the Nvidia Geforce G105M isn’t up to much in terms of gaming. If you’re happy sacrificing power and a fair wedge of cash for style, the UX50V will probably appeal. But we think Asus has its work cut out in persuading customers to shell out £999 for its latest catwalk queen. The Asus UX50V-RX05 is closer to an oversized Netbook than a mainstream laptop. If you took the Asus Eee PC 1005HA and doubled its weight and price, you'd basically end up with the UX50V. This 15.6-inch laptop shares many design cues with the Eee PC 1005HA, with its sleek profile, tapered edges, and glossy chassis. Unfortunately, it also shares roughly the same performance profile as a Netbook, thanks to its underpowered, single-core CPU. With its low-end single-core processor, dedicated GeForce graphics, and 16:9 display, the unquestionably sleek, entertainment-minded Asus UX50V-RX05 is a good fit for a specific user profile: the movie lover/sometime gamer. According to Asus, the UX series is 'an intricately crafted series of notebooks that provide both contemporary style and effortless computing on the go'. In human speak, that means they're thin and light, look awesome and have funky new components. The UX50V, reviewed here, is being sold by online retailers for around £910. The Asus UX50V is great to look at, but it's let down by relatively average performance and design features that detract from the overall user experience. Its shiny finish will appeal to magpies and those with design degrees, but the cheaper, slightly less attractive MSI X340 -- or indeed an Apple MacBook -- might be better options. A stylish and high-quality offering from Asus, but not the fastest machine. 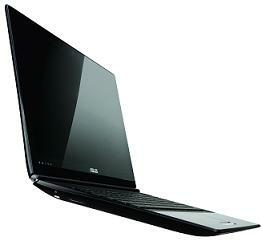 Asus' UX range is aimed at the high end of the laptop market, and targets rivals such as Sony's VAIO range. The UX50V is a compact and stylish 15.6-inch machine, offering impressive quality and a distinctive design. The Asus UX50V offers a lot of style and quality for the money. It's also a comfortable choice with decent 3D power on offer. Whether it's stunted by the single-core processor remains to be seen, but it's still an impressive start.